While Man was created by whim of the One True God and Elfs were born into the world upon its first light; Trolls lay claim to the fact that they existed when the world was but darkness and star sparkled skies. They wandered the mist-shrouded hills of the pagan earth before God graced it with his beneficence, and they dealt in dealings with the Fey in times when magic was thicker than dragon's spume fog. They worshiped the cold glowing moon at its skyward apex, the bitter north wind, and the warmth of a troll hearth; and in such things they took great comfort. But over the ages they saw the signs of change, spoken in low rumbles by the grumbling earth beneath their feet; and those who could not take the changes to come felt the darker calling of atavistic barbarism. 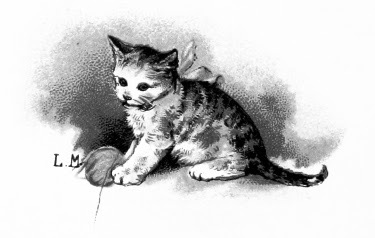 The barbaric and foul troll is that which most of humanity is familiar with, by way of story or drunken bawdy ballad; but the sane and kindly sort still exist even if mostly in secret. These trolls are the huldr, the hidden folk, who still see the auguries of dark days to come for their people but have not fallen to the primitive scream of date defied that drives their foul cousins like a predator's beating heart. They live fairly simple lives, pay homage to nature, and avoid interacting with other races largely due to the threat of pogrom or troll hunt. But it is not unknown for smaller races to appeal to a troll for their strength. Offers of gold, glory and privacy can tempt a troll almost as well as true hospitality and oaths of loyalty, which makes a troll not an uncommon sight in the mercenary bands of the crafty or in the elite guard of borderland nobility. Some trolls will find their way into the company of man or elf simply by reading the auguries of the world and choosing to accept the whims of fate. 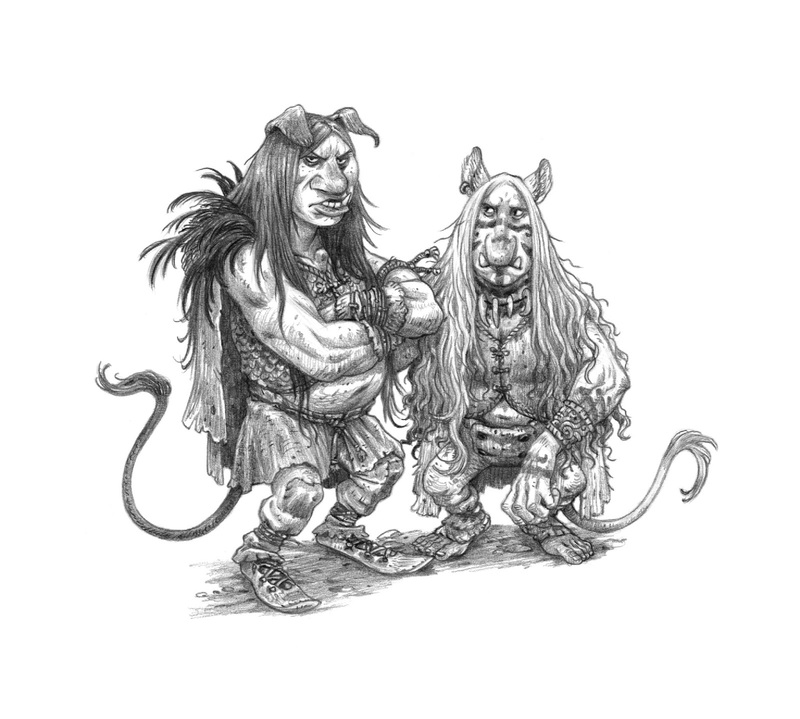 Trolls in general share only a small amount of traits with one another, leading them to vary greatly as a race. They have prodigiously long noses, though some have snouts like a horse instead. Their eyes are generally beady in comparison to the rest of their faces, and of a solid color which is often black or white. They are large, with a runty troll still being around five feet tall and two hundred pounds, with a larger and more common specimen being well above eight feet tall with rippling muscles and four hundred plus pounds of weight. Their flesh is scabby in texture and often softly flesh toned with hints of stone-like coloration accenting it. Trolls have flicking tails and swaying ears like those on a donkey, with hair the same color as their luxurious manes upon their scalps. 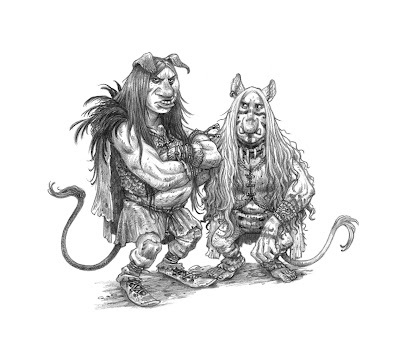 But in addition to these general traits, trolls sometimes have horns or tusks or claws; some have stone growing from their flesh or rune-work patterns carved into their limbs. Some will grow these traits and lose these traits during phases of their life, leading to a variety of strange looks within a troll’s adventuring years. Why would a troll wander the wildwood with strange companions? Most likely in pursuit of the augured path that Fate has driven them towards, or perhaps in defiance of that fate which will lead to a tragic and monstrous end. Others will be motivated by mortal greeds, lust for treasure to woo a trollwife, or lust for mortal hedonistic pleasures which will make such domestic thoughts seem pointless. An oath might send a troll to adventure, as there is nothing more sacred than an oath to a troll; as such words define one's fate. The Moon’s Secrets: Trolls can understand whisperings on the nightly northern wind as well as converse simple ideas with nocturnal creatures such as wolves or bats, with a success rate of 4-in-6. Trolls do not need to sleep on nights of the full moon, though they may enter a torpor state if they so choose, and discern strange visions of what fate demands of them. Ancient Blood: Trolls are long-lived, time is barely even a concept they obey save for acknowledging it marches ever forward towards predestined fate. As they are astonishingly long lived, most have astoundingly good health. If a troll is able to eat, they are able to heal d12+Level+Constitution in HP overnight, rather than just their Constitution Bonus or a single Hit Dice in ideal circumstances. Rune Flesh: Trolls may research magical spells as other magical classes can, though they may only cast spells if they have carved runes of power into their flesh. The Troll loses 1d6 hit points for each spell they’ve carved into their skin, and this damage cannot be healed until the spells have been cast and the troll has rested. Spells carved into the flesh of a Troll are regenerated for use on the next night of the full Moon (causing another 1d6 damage per spell), and such spells cannot be cast upon nights of the new moon. 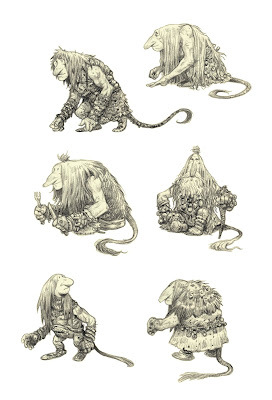 Troll Boons: Trolls are unique creatures who adapt to what fate demands of them. At first level, every odd level thereafter, and level ten, they gain access to a unique boon that spontaneously manifests overnight. They may pick from the following abilities. Stone-Colors: The Troll may turn themselves and anything they are directly touching into the color of stone. Provided the Troll remain completely still, they appear indistinguishable from stone at a rate of 4-in-6. Auspicious Sights: The Troll is able to discern truths as related to their fate. They gain Advantage on Geas Saving Throws against spells that would otherwise force them to act against their best immediate interest. Shaggy Coat: The Troll has a thick and shaggy mane of hair that helps protect their body against enemy attacks. The Troll gains +2 AC whenever they are unarmored. Whippering Tail: The Troll’s tail operates almost like a third limb, able to grab small items from nearby at a rate of 3-in-6 as a free action. Foul Tusks: The Troll grows large dagger-sized tusks, with which it may make a biting attack that deals 1d6 damage. If the troll kills a living enemy smaller than itself in this way, they may devour the enemy and regain that creature’s HD in HP. Gnarled Horns: The Troll grows a pair of horns or antlers, which grant it the ability to make a ramming attack that deals 1d6 damage. If the horn is sawed off and ground into a powder, it can be used to cure poisons. Horns lost regrow on the full moon. Regeneration: The Troll may reattach severed limbs, provided they were not removed with weapons of loyal iron, fire, or acid; by simply putting the severed limb up to the stump. Those that were removed by such implements must be painfully reattached and have 2-in-6 successful rate of healing back to being usable. 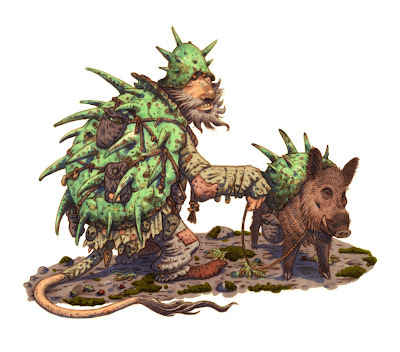 Vomitous Bile: The Troll may wretch forth all they’ve consumed in a spray of stomach acid which deals d8+Level damage to all hit by it (Save vs Dragon’s Spume for half). The Troll becomes immediately fatigued afterwards. Lore-Scents: The Troll can smell out magic and its origin upon the winds, discerning whether it be natural magic, fey, diabolical, divine, or alchemical in nature at a rate of 4-in-6. The truth of the spell remains unknown, but the strength of the spell determines how saturated the stench is. Curses are always noticed, as they smell foul. and none of this art I'm using is used with permission. Design Notes: Removed the wu jen's creeping taboo thing, as it encroached too closely to being like the priest. Need to make some good charts for discerning fate and auspicious signs for the troll; but I like them as being ancient creatures who shift as fate demands with evil trolls being those who denied fate, broke oaths, and as such are monstrous. As for how saves go: Enchantment is Fey Magics, Substance is Poison/Imbibed Stuff, Geas is Divine/Infernal, Spume is Dragon/Breath stuff, Ensorcelment is Mortal Magics.